Think human toddlers have cornered the market on youthful defiance? Well, think again. 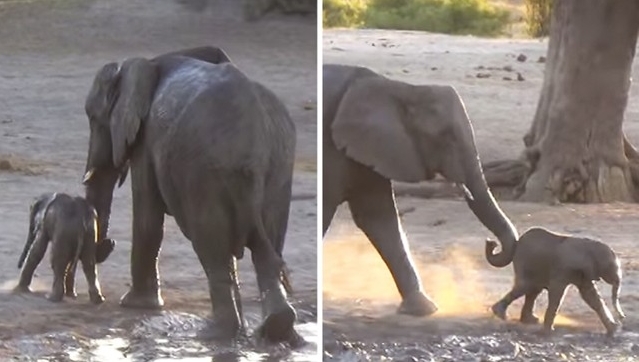 Here's a rather comical little spat between an elephant mother and her baby — one that anyone who's ever raised a child can relate to. The pachyderm pair had been enjoying a dip in a watering hole in Zimbabwe's Hwange National Park when, with the sun setting, mom decided that bath time was over. Her baby, on the other hand, clearly disagreed. Elephants are considered a keystone species in the African landscape. That means elephants play a key role in maintaining the balance of all other species in the community. They pull down trees and break up thorny bushes, which help to create grasslands for other animals to survive. They create salt licks that are rich in nutrients for other animals. They dig waterholes in dry river beds that other animals can use as a water source, and their foot prints create deep holes that water can collect in. They create trails that act as fire breakers and water run offs. Other animals, including humans, depend on the openings elephants create in the forest and brush and in the waterholes they dig. Responses to "Baby Elephant Refuses To Accept That Bath Time Is Over"